The Peruvian artists Edi Hirose, Alejandro Jaime, Lucia Monge and Eliana Otta are joining this station. ETF! artist Nele Azevedo is performing her "Minimum Monumento" for the opening of examples to follow! in Lima, tomorrow 28th of October 2014 from 12:00 onwards in front of the MALI (Museo de Arte de Lima). Come and enjoy! 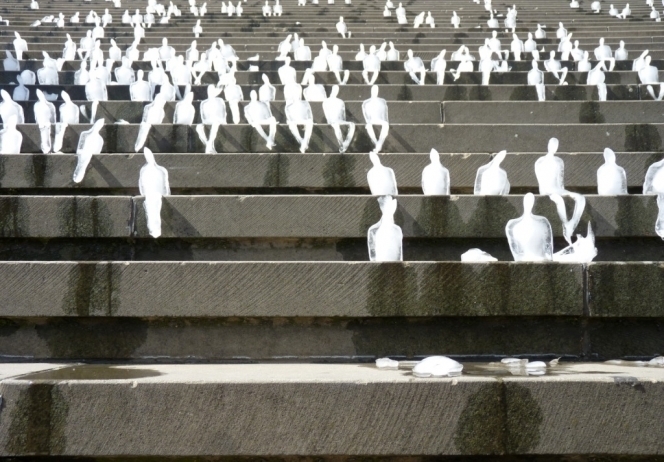 Disfruta en vivo de "Minimum Monumento", una intervención realizada por la artista brasileña Néle Azevedo, quien a través de sus esculturas de pequeños hombres de hielo, nos invita a reflexionar sobre la idea de que la existencia no es ni será eterna. Para ser parte de la primera intervención de ¡ejemplos a seguir! solo debes acercarte este 28 de octubre a partir de las 12:00 p.m. a las escaleras del MALI (Museo de Arte de Lima). Nature Conservation, Building and Nuclear Safety. Partners are Goethe-Institut Lima, INTE (the Institute of Science for Nature, Territory and Renewable Energies) and the municipality of Lima with the assistance of the German Embassy. sincerely hope it will also be a big step towards the formation of a Fund Aesthetics and Sustainability, the goal ETF! is seeking for.